September 2016: SunHerald: Agriculture Department saddles up new show horse protections. August 2016: The Chattannooga.com: Roy Exum: Sored Horses Bow Out? February 2016: Instagram: Aka. "Soring" intentional pain is forced onto their limbs so they will be able to perform unnatural movements. October, 2015: HorseTalk.co.nz, HSUS condems soring - related violations at walking horse show. April, 2016: yahoo answers: how do you think soring in Tennessee walking horses can be stopped? August, 2015: WSMV Nashville, TN: Covers Protest Outside of Walking Horse Competition. August, 2015: WSMV Nashville, TN: Billboards Raise Awareness about Illegal Horse Soring. August, 2015: WVLT, Knoxville, TN: The Famous Murfeesboro ThorSport Farm (Recent Newcomers to Big Lick with Substantial Financial Backing) Disclosed in Undercover Investigation with Soring Discoveries. August, 2015: PressZoom: Detailed Undercover Investigation Reveals Tennessee Walking Horse Abuse at Top Training Barn: Proof that Soring is Alive and Well just days before the big Celebration Show. August, 2015: The Tennessean, Nashville, TN: Letter to the Editor: Why is Tennessee Shying from Supporting this Bill? November, 2015: The Chattanoogan: Roy Exum: Vote DesJarlais Out! November, 2015: Chattanooga Pulse: Where Are Our Voices for Animals? May, 2015: HSUS Boss Labels Alternative Walking Horse Bill a Sham: Senator Lamar Alexander (R-Tenn.), Senate Majority Leader Mitch McConnell (R-Ky.) and Senator Rand Paul (R-Ky.) introduced the Horse Protection Amendments Act, S. 1161. April, 2015: Chattanoogan, Chattanooga, TN: Roy Exum: Who is this Barbarian? April, 2015: The Decatur Daily, Decatur, TN: 72% of the Public Votes “No,” Celebration Arena Should NOT have Hosted the Tennessee Walking Horse Trainers’ Show Given its Soring Record. April, 2015: 54 Walking horses rescued, found living in filth. April, 2015: Decatur Alabama Newspaper OnLine Poll has Landslide 70% Vote about Celebration Hosting Show with Horse Soring Violations History. March, 2015: Mississippi’s Children’s Hospital Severed Ties with Mississippi Charity Show in Jackson, MS.
North Carolina State Fair Bans “Big Lick” for 2015. March, 2015: Shows and Events that Have Banned the Big Lick. May, 2015: Rate My Horse Pro: Bill Reintroduced in Attempt to Say Who to Horse Soring. April, 2015: Richmond Times Dispatch, Richmond, VA: Warner’s Wise Move Joining Crack Down on Tennessee Walking Horse Abuse with the PAST Act. April, 2015: Horsetalk, New Zealand. April, 2015: Federal Legislators Reintroduce PAST Act. April, 2015: The Chattanoogan, Chattanooga, TN: Roy Exum: FBI to Study Lickers with Animal Abuse as a Predictor of his research indicated a direct correlation between animal cruelty and human violence. 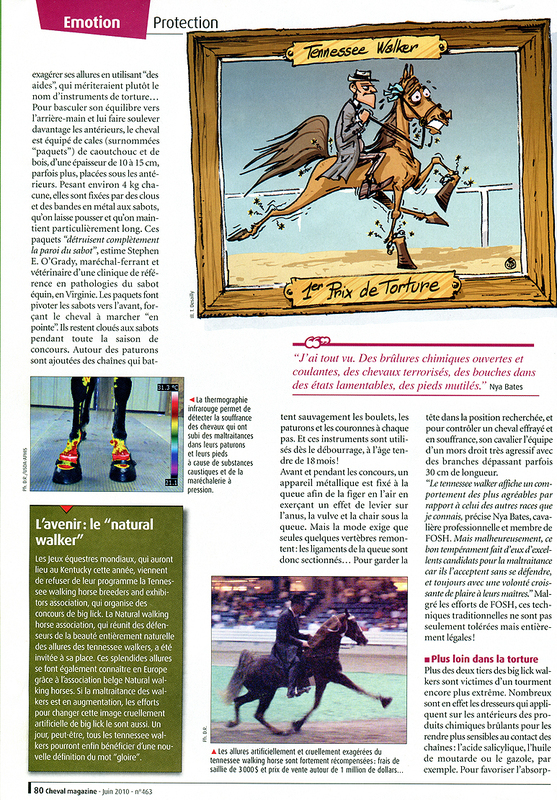 November, 2014: Horse and Rider Magazine: Time to End Soring for Good? November, 2014: Trailblazer Magazine: "The Big Lick: When will it End?" August, 2014: WPLN Blog: Can Blood Tests and X-Rays Solve the Walking Horse Soring Problem? August, 2014: Horsetalk, New Zealand: Close Loopholes Over Soring Suspensions, says HSUS. August, 2014: The Tennessean, Nashville, TN: The Practice of Horse Soring Must End. June, 2014: Dr. Ramey, Can you help America's horses? June, 2014: Philadelphia Inquirer: Horses on the Hill: Advocates push equine welfare in D.C.
July, 2014: The Tennessean, Nashville, TN: Withdrawing Bank Sponsorship from the National Celebration Shows Integrity. June, 2014: Video footage of the Walk on Washington to Support the PAST Act. June, 2014: ABC News: Members of Congress Tackle Horse Torture with WOW in Washington, DC. June, 2014: The Daily News, Maryville, TN: Trial Date set in Wheelon Horse Soring Case for July 23. June, 2014: WMOT, Murfreesboro, TN:; Animal Rights Groups Promoting Tougher Federal Tennessee Walking Horse Anti-Soring Regulations are Planning a Walk on Washington. May, 2014: HSUS: The Big Lick: Fancy Footwork, or Intentional Cruelty? April, 2014: Horsetalk, Could popular anti-soring bill founder? April, 2014: Dallas Morning News, Dallas, TX: Support Adding the Prevent All Soring Tactics Act to the Federal Horse Protection Act. April, 2014: Horsetalk, New Zealand: Could Popular Anti-Soring Bill Founder? April, 2014: Care2.com: Dear Congress: Thanks for Stepping in to Protect Horses from Cruel Training Practice. April, 2014: VIN Veterinary News: Dueling Legislation a Sore Spot in Horse Community, by Veterinarian Dr. Linda Montgomery of TWHBEA Board. April, 2014: Houston Press, Houston, TX: Feel Like Cracking Down on A-Holes Who Torture Show Horses? April, 2014: Digital Journal.com: U.S. Navy Veteran Rides Into Legislative Battle on 1,150 mile Journey On Two Tennessee Walking Horses to Support PAST Act. April, 2014: CQ.com: News about Congress: Laming a Horse-Welfare Bill? March, 2014: DVM 360 News: Bill Backed by Walking Horse Group Introduced to Counter Anti-Soring Legislation. March, 2014: Courier Journal: Commissioner Bonnie Speaks Out Against Tennessee Walking Horse Soring and for the PAST Act. March, 2014: AAEP Opposes HR 4098, the “Blackburn Bill” on Horse Soring, in Favor of HR1518. March, 2014: The Chattanoogan, Chattanooga, TN: Roy Exum: Our Ruse in Congress over the PAST Act vs. the Blackburn Act. February, 2014: Rep. Marsha Blackburn’s Tennessee Walking Horse Bill Draws Praise and Criticism. January, 2014: Canadian Broadcasting Channel: Episode of “Heartland” series features the aftermath of Big Lick soring. Episode 12 of the 7th series. December, 2013: The Tennessean, Nashville, TN: Former Walking Horse Industry Leader Testifies, Takes Job for Whitman. December, 2013: Priscilla Presley Urges Congress to Pass Legislation to Protect Tennessee Walking Horses from Abuse. December, 2013: Wheelon and Workers Please Not Guilty; Trial Date Set for Feb. 10, 2014. Nov., 2013: East Tennessee Walking Horse Association Complains that HR 1518 Would End their Industry: Read the TN Public's Comments at the End of the Article! October, 2013: The Chattanoogan: Lickers Get Caught Again for Opposing Vice President’s Actions to Poll Membership on PAST Act. Sept. 2013: Congressman Whitfield Corrects Shoeing Restrictions in Letter to TWHBEA. August, 2013: AVMA Footage of Celebration Inspections: Walking Horses Continued to be Sored. August, 2013: Horsetalk, New Zealand: Congress Has Potential to End Soring Forever. August, 2013: HorseChannel.com: New, stiffer penalties for violators of the Horse Protection Act have been enacted for this year's show. August, 2013: Concord Monitor, New Hampshire: Senator Ayotte is Cracking Down on Animal Abuse Introducing the PAST ACT S. 1406. August, 2013: Horsetalk, New Zealand: Walking Horse Group Opposes Bill Aimed at Ending Soring. August, 2013: Step-by-Step Progress Protecting Tennessee Walking Horses (Op-Ed) LiveScience.com. As seen in this image, soring involves the application of caustic chemicals and ... the 2012 Celebration event, the biggest Tennessee walking horse competition. August, 2013: Animal Attraction: Federal Court Protects Tennessee Walking Horses KHOU (blog)... upheld federal regulations to prevent the practice of "soring," in which trainers abuse ... for inspections at the Tennessee Walking Horse National Celebration." July, 2013: Roy Exum: Horse Celebration Appears Doomed! July, 2013: KFGO: Animal Rights Group Sponsors Alternative Tennessee Horse Show. July, 2013: The Chattanoogan, Chattanooga, TN: Jackie the Jerk is Done by Roy Exum. June, 2013: WBIR-TV, Knoxville, TN: Two More Arrested in Maryville Horse Soring Investigation. June, 2013: The Tennessean, Nashville, TN: The Tennessee Walking Horse Industry faces Uncertain Future. May, 2013: The Chattanoogan, Chattanooga, TN: "Ag-Gag" Bill is Aimed at Hiding Horse Abuse. May, 2013: Nashville, TN: Ag Gag Bill Sponsor Has Violations Himself! May, 2013: The Chattanoogan, Chattanooga, TN: Humane Society Says 75% of Horses at Walking Horse Celebration Tested Positive for Illegal Chemicals. May, 2013: Trainer Wheelon Accused of Soring Crimes Claims his Innocence. May, 2013: Maryville Daily Times: Wheelon Eviction Sought; Horse Soring Suspect makes Court Appearance. April, 2013: Chattanooga Times Free Press, Chattanooga, TN: Disgraced Former Horse Trainer Prosecuted Here is Indicted Again on 22 Counts of Animal Cruelty. April, 2013: Vet Practice News.com: Soring Opponents Get Another Chance to Enact Nationwide Ban with HR 1518. April, 2013: New York Times: Taping of Farm Cruelty is Becoming the Crime, with examples given including soring. April, 2013: The Horse.com: House Bill would Amend Horse Protection Act. April, 2013: Blount County Daily Times: Wheelon Being Evicted after Horse Soring. April, 2013: Ellen DeGeneres and HSUS President discuss the Ag Gag Legislation in Tennessee, initiated to prevent investigations that brought TWH Trainer to Trial for Soring. April, 2013: Horsetalk, New Zealand: Tennesse Governor urged to Veto Whistleblower Bill to Avoid more Public Mistrust and Skepticism About the Workings of the Tennessee Walking Horse Industry. April, 2013: USDA Releases 2012 Foreign Substance Swabbing Results, with a Shocking 76% positive at the Celebration and 65% positive for the Year. January, 2013: Lexington Herald Leader, KY: Horse Park might host sale that could include controversial big-lick performance horses. November, 2012: Roy Exum, The Chattanoogan: Evil, Twisted, Inbred People. October, 2012: Press Release: Celebrities Urge Support for Federal Legislation to Protect Horses from Abuse. October, 2012: The Chattanoogan, Chattanooga, TN: Roy Exum: No Criminal Background? Sept. 2012: Rood & Riddle Veterinary Group Releases Statement on Tennessee Walking Horses to Enthusiastically Support Efforts to end Soring. Sept. 2012: Walking Horse Report Interview Dr. Scott Hopper from Rood and Riddle on TWH Soring. Sept, 2012: HorseTalk, NZ: Grim Picture of McConnell's Soring Practices Described. Sept. 2012: Shelbyville Times-Gazette, Shelbyville, TN: Cohen co-sponsored bill to Make Soring a Felony. Sept. 2012: DVM 360: US Reps from Tennessee and Kentucky Sponsor HR6388 to Amend Horse Protection Act. Sept. 2012, Knoxville News: Several Walking Horse Owners to be Investigated. Sept. 2012: San Francisco Chronicle: Several Walking Horse Owners to be Investigated per District Attorney General. Sept., 2012: The Chattanoogan, Chattanooga, TN: Letter to the Editor from Wayne Pacelle, HSUS: Turn the McConnell Lesson into Something Bigger. September, 2012: Roy Exum, The Chattanoogan, Chattanooga, TN: Finally a Day of Reckoning and the David Howard Connections. Sept. 2012, The Tennessean, Nashville, TN: Horse Soring Bill Faces its Share of Resistance. September, 2012: Memphis Commercial Appeal: Memphis, TN: Congressmen Push for Banning of Soring. Sept. 2012: Congressional Representatives Discuss bill to Strengthen Horse Protection Act. August, 2012: The Chattanoogan, Roy Exum: What Is Rep. DesJarlais Doing? August, 2012: The Chattanoogan: Roy Exum on What is Representative DesJarlais Doing Supporting the Big Lick? August, 2012: Chattanooga WRCB-TV: Punishment was handed down for one of four men who pleaded guilty to the soring of Tennessee walking horses. John Mayes will face more jail time. August, 2012: The Chattanoogan: Roy Exum: Is Scott DesJarlais, Congressman Representing Big Lick Industry, Crazy? August, 2012: The Chattanoogan, Roy Exum: It's Not the Court's Fault. Right now the scurrilous side of the Tennessee Walking Horse industry is in a desperate fight with the U.S. Department of Agriculture over the way horses are judged. August, 2012: The Horse: SHOW to Conduct TWH Celebration Inspections, USDA States, “Because the Celebration will occur before this decertification process will reach its conclusion, SHOW will carry out inspections at the Celebration." - SHOW to Conduct TWH Celebration Inspections. July, 2013: The Chattanoogan: New Horse Celebration CEO is Who? By Roy Exum - Roy Exum: New Horse CEO Is Who? July, 2012: Chattanooga Times Free Press: Tennessee Walking Horse Inspectors may be decertified. July, 2012: Chattanoogan: Roy Exum: Horse Abuse in TN: Just Dial 911. July, 2012: The Chattanoogan: Roy Exum's Article on Mike, Turn Back! Get Out! July, 2012: The Chattanoogan: Roy Exum Ties TN Candidates to New Law Proposed to Shelter Horse Soring: No, I'll tell you what is truly shocking. Within six weeks of the million-seller tape, SHOW had sued the U.S. Department of Agriculture, lambasted the Humane Society, been vilified by three prominent veterinarian groups, nearly destroyed the image of a magnificent breed of horse and insulted the integrity of the very employers of the USDA - we, the people of the United States of America. June, 2012: The Memphis Flyer: Animal Advocates Push for an End to the Walking Horse Category at a Local Show. June, 2012, The Chattanoogan, Roy Exum: What Happened to Horse Sense? The Tennessean - He is charged with knowingly filing false entry information at the Liberty Lions Club Horse Show in Shelbyville, Tenn. on June 15. The Tennessean - Tennessee Walking Horse trainer Joe Cotten has been suspended for 7½ years and fined $5000 by the SHOW Horse Industry Organization. June, 2012: The Chattanoogan: Roy Exum: Now the Horse Trainers are Galloping! June, 2012: The Tennessean, Nashville, TN: Horse Industry Numbs Pain for Abusers: Editorial states: "As long as saving the industry comes before saving the horses, the abuse will continue. Walking Horse fans would do well to compare words with actions before they spend another penny toward a show ticket." June, 2012: KMAS, ABC News: Veterinary Groups Push for Better Protection for Championship Horses: "Citing allegations of "extremely abusive" practices that persist in the world of Tennessee Walking Horses"
June, 2012, Horsetalk, New Zealand: $10,000 reward offered over soring violations: the HSUS is encouraging the reporting of soring offenses in light of the recent prosecution of well-known Tennessee Walking Horse trainer Jackie McConnell. June, 2012: The Horse blog: "If a segment of the horse industry cannot survive without abusing the horses it depends on, then it shouldn't survive." June, 2012: WRCB Chattanooga, TN: Tennessee Veterinary group calls for further investigation into the training and showing of Tennessee Walking Horses. June, 2012: ABC News: Veterinary Groups Push for Better Protection for Championship Horses. June, 2012: The Chattanoogan: Humane Society Of United States Offers $10,000 Rewards For Tips On Horse Soring. June, 2012: Roy Exum "Two Horse Owners Write" Read these very recent observations from horse owners at a show. they will break your heart for the horses. June, 2012: Trail Blazer Magazine, letter from the Publisher against TWH Soring Abuses. Jeff Dockery, who along with high-profile Tennessee Walking Horse trainer Jackie McConnell and two others was indicted earlier this year for violating the Horse Protection Act (HPA), has pleaded guilty to one of the counts against him. By Sara Patterson Southern Serenity Ranch Tennessee walking horse Walk Hard is shown by Patrick Thomas at the Germantown Charity Horse Show. Walk Hard was checked by inspectors before entering the ring to ensure there was no evidence of soring. By Robert Longley, About.com GuideJune 8, 2012 Soring is a practice typically used in the training of Tennessee Walking Horses and related breeds to accentuate the horse's distinctively exaggerated gait rewarded in competitions. ... (http://tnne.ws/Kf3qWs), the US Department of Agriculture's new rule will require organizations that inspect horses to assess minimum penalties to violators of the Horse Protection Act, including violations from soring Tennessee Walking Horses. The Tennessee Walking Horse Celebration is heralded as a festive event, one that showcases the best of the breed and draws hundreds of people to Shelbyville, Tenn., each summer to see which competing horse will be crowned the World Grand Champion. Undercover investigation reveals abusive practices; multiple violations of Horse Protection Act cited. NASHVILLE - Eight of the last 10 winners of the Trainer of the Year award ... review by The Tennessean of a database maintained by Friends of Sound Horses. Roy Exum: Guess Who Judges Horses? Banners Dixie-Bell is the current National Walking Horse Association champion. McGregor says he trains mainly flat or lite shod walking horses which do not wear platform pads on their feet. Senator Congressman Schrader addresses the USDA's Horse Protection Act and the issue of "soring"
May, 2012: McConnell Plea Agreement from United States District Court. May, 2012: ABC Nighline "Torture of Tennessee Walking Horses"
May, 2012: Shelbyville Times-Gazette: McConnell changes plea in HPA case to Guilty. March, 2012: Chattanooga Times Free Press video: Nathanael and Jennie Jackson speak out against Action Devices and Soring. March, 2012: Shelbyville Times: The Walking Horse Trainers' Association initiative for comprehensive drug testing program. March 18, 2012: Chattanooga Times Free Press: Indictment Shines Light on Abuse Allegations in Tennessee Walking Horse Industry. March, 2012: HSUS CEO Wayne Pacelle blogs against horse soring; vehement public comments follow. March 15, 2012: AVMA, American Veterinary Medical Association: "High time for Change"
March 8, 2012: The Tennessean, Nashville, Senator Joseph Tydings Op Ed Article: Fight to End Soring is Everyone's Duty. March 7, 2012: Associated Press: Humane Society Says Horses in Tennessee Still Being Sored. July, 2011: The Republic, Chattanooga, TN: Horse soring defendant locked up after video shows him working on horse while on bond. July 2011: Marshall County Tribune, "Horse Trainers Resist More Regulations." June, 2011: Marshall County Tribune, "More Horse Protection Eyed." December, 2010: Equine Journal: FOSH Commends the USDA for 2011 Penalty Protocol. Nov. 2010: Capital Press: Audit: Horse Show Oversight Lacking. 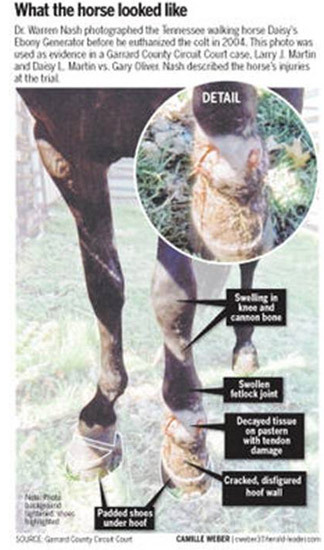 November, 2010: Lexington Herald Leader: USDA to Address Anti-Soring Horse Conference. October, 2010: Read the full OIG Audit of the USDA regarding the Horse Protection Act, and see the USDA’s responses. Huffington Post: Federal Audit Finds Rampant Abuses of Show Horses, Agency Reform Promised. May, 2010: Annual Animal Care Conference program on Soring of Tennessee Walking Horses presented by Keith Dane and Lori Northrup. March, 2010: New Soring Investigation Procedures Announced by USDA, The Horse. March, 2010: Kentucky Walking Horse Association defends itself to Racing Commission, Lexington Herald-Leader. February, 2010: Kentucky Horse Breeders Incentive Fund Decision to use 3 Sound HIOs for Shows: NWHA, FOSH and IWHA. Jan. 2010: AAEP Convention Interview of Dr. Rachel Cezar on the USDA Horse Protection Program. Kentucky Legislators Told of Measures to Prevent Horse Soring,” Kentucky.com"
September, 2009: Walking Horse Breeders' Kentucky Incentive Funds Tied to HPA Compliance, The Horse, Lexington, KY.
August, 2009: SHOW Levies 3 Lifetime Suspensions to Violators Caught Using Cruel Nerve Cord Into Horse's Gums. Chris Zahnd appeared for his previously scheduled hearing before the SHOW Hearing Committee today, August 20, 2009. Prior to the commencement of the hearing, Zahnd, through his attorneys, agreed to serve the lifetime suspension previously handed down by SHOW HIO and did not go forward with the hearing ...read more! August 2009, “Open eyes to suffering of walking horses,” letter to the editor in The Tennessean. August, 2009: Walking Horse Celebration Show Inspectors Ready: Federal USDA inspectors are out in full-force. The Horse. August, 2009: Ky. panel to consider restoring money to walking horse breed after soring investigation, Lexington Herald-Leader. One judge noted "the sheer scope and ambition of the series, which demonstrated a willingness to take some risks at a time when fewer reporters and editors seem willing to do so.” Another remarked on the “writing's passion and power, which built among readers a sense of anger about this abuse of horses and the ability to these criminals to get away with it.” ...read more! July, 2009 - Recent controversy surrounding soring and inspections of walking horses is having an enormous negative impact on the region's economy, Shelbyville Times. June, 2009: American Farriers Journal Wins Three Awards from American Horse Publications; First Place for 4-Part Series on Soring in Tennessee Walking Horse Industry. May, 2009: Kentucky Horse Breeders' Incentive Fund (KHBIF) has issued the following statement to clarify the article titled "Fund Walks Away from Walking Horses" in Horse & Rider's May 2009 publication. March, 2009 - Pilot Club’s horse show postponed due to NHSC uncertainty. March, 2009 - Walking Horse Report article explaining the changes being considered from Trainers, NHSC, Celebration, etc. March, 2009 - Stimulus Money Shouldn’t Forget Animal Rights. Mark Markariam’s article includes funding needed for Horse Protection Act. November 2008 - The Humane Society Applauds Court of Appeals Decision against Horse 'Soring' by Jill and Herbert Derickson. Sept. 2008: State Regulators Investigate Breeder Incentive Recipients, The Horse magazine. September, 2008 - Senator Mitch McConnell, R-Ky., pressured the USDA for years to back off its enforcement of the Horse Protection Act. September 2008: A Girl Scout Troop created this educational DVD on why Soring Gaited Horses is Wrong and Inhumane. Titled "See it Through My Eyes," their video won the highest honor possible: the Girl Scout Gold Award. September 2006 - 2006 Celebration Video, with horse falling with rider about 1/3 into video: "Walking horse universe crippled -- But soring controversy doesn't dull enthusiasm" by Jon W. Sparks"
November 2005 - "Why Soring Persists" special report in Equus magazine. 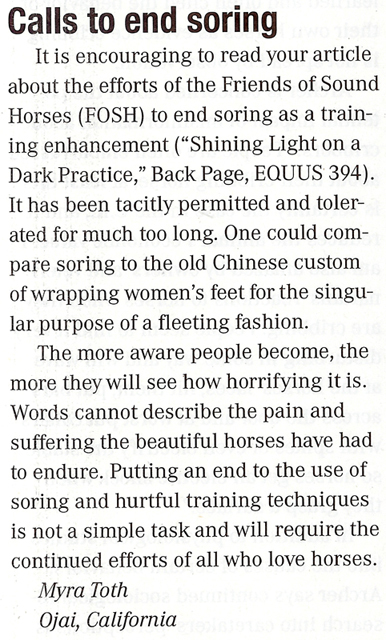 Winter, 2002: Rhonda Hart Poe writes about “More than Sore” in the Gaited Horse magazine, exposing soring, training methods, artificial hoof angles, cruel bits, and more. August, 1999: Historic Event when Natalie Jackson shows her Lite Shod Stallion in the World Grand Championship Class! April, 1988: Walking Horse Industry is shut down by federal judge's ruling outlawing pads and chains. Dec., 1964: Sports Illustrated: "Sore Foot Detective: Crusader Pearl Twyne Threatened as She Works to Investigate Soring." June, 1960: Hot Heads over Hot Feet, Sports Illustrated. TWHBEA annual meeting breaks out in violence over soring issue. February, 1960: Telltale Hoofs: The ring was elegant at Miami's Charity Horse Show, but behind the scenes the abuse of the Tennessee Walking Horse continued unchecked. January, 1960: Read comments from the Sport Illustrated readers, such as:"I had thought that the sweet old Walking Horse had escaped the diabolical treatment inflicted on the other breeds of show horses. The American horse shows are a display of cruelty from beginning to end." January, 1960 - Sports Illustrated "The Torture Must End.